Brass Goggles: What is Steampunk? Airships, clockwork contraptions, steam engines, gears, cogs, Victorian fashion, gaslights, and of course, goggles. All of these trappings hold the flavor of Steampunk. Defining the exact boundaries of a genre is difficult at best and impossible most any other time. I usually think of Steampunk as 19th century earth but with anachronistic technology, or rather, modern devices created with 19th century technology. Usually steam-powered, hence steampunk. It is what would have happened if the Industrial Revolution went wild. So we have determined the first root of the word steampunk, but what about the other part? I tend to believe that the punk is derived from the rebellious, swashbuckling element of the genre. Adventure. Defiance. Many stories of the genre defy established social mores, religious dogma, and government philosophies. Punk also embodies the do-it-yourself anthem of the Steampunk culture. Steampunk has its roots in speculative fiction with the works of Mary Shelly (Frankenstein: or, The Modern Prometheus, 1818), Jules Verne (Journey to the Center of the Earth, 1864) and H.G. Wells (The TIme Machine, 1895). Steampunk truly came into its own in the 80s with the works of K.W. Jeter (Morlock Night, 1979 and Infernal Devices, 1987) [who is said to have coined the term Steampunk], Tim Powers (The Anubis Gates, 1983), and James Blaylock (Homunculus, 1986). But it was 1990’s The Difference Engine by William Gibson and Bruce Sterling that garnered the genre worldwide attention. Much of the work written under the Steampunk genre are set in the Victorian Era, or some Neo-Victorian world. However there are also plenty of settings with Wild West, Lovecraftian, and Medieval influences as well. Many consider Steampunk a derivative of Cyberpunk as the two genres tackle the same social issues and themes. It is also because of Gibson and Sterling’s significant contribution to genre and the fact that they were masters of the Cyberpunk genre before entering the world of steam. In contempory technlogy, all of the working parts are hidden from view. No one wants to be bothered with how their car functions, as long as it functions. In the Steampunk genre, all the mechanical innards are exposed in all their widgety grandness. This is a subconscious reaction to sleek and invisible of modern devices. Not that Steampunk cannot be sleek. It can be sleek and beautiful, but you’ll recognize it as Steampunk immediately. The cogs, gears, and springs of clockwork automata can be seen turning and whirring, half-hidden behind a riveted boiler plate guard. Plumbing, conduits, and guages are exposed in a web of copper and brass tubing. 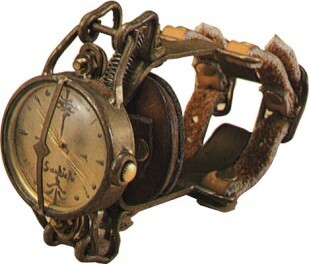 Steampunk design also has influences from the art-deco and gothic movements. Fashion also plays a vital role in the imagery of the Steampunk genre. I find it is usually a mixture of Victorian or Edwardian historical fashion, Wild West style, and WWII flight equipment (the GOGGLES!) that has been given a touch of extravagance, flamboyance, and industrialism. This really is just a small sampling, if you would like to see more examples of Steampunk in media and entertainment you should check out Aether Emporium’s extremely exhaustive lists for Roleplay & Gaming; Cinema, Film, & Music; Books & Comics; Art; and Clothing & Costuming. Aether Emporium really is a one-stop site for all your Steampunk needs. Alternatively, check out Wikipedia’s List of Steampunk Works. There is a cultural movement to adopt the Steampunk aesthetic as a lifestyle. Much like the goth, punk, and industrial counter-cultures, the fans of Steampunk immerse themselves in the trappings of the genre. Fashion and music take center stage, but many steampunks also use the theme in home decor where these do-it-yourselfers modify modern devices to emulate Steampunk gadgetry. With any culture, events and conventions are bound to appear to cater the fans. You have the California Steampunk Convention happening THIS WEEKEND! The Edwardian Ball is something I think I will be taking my wife to in the near future, it’s inaugural event happens in January. And of course, SalonCon happened in September. Steampunk has even made it to MTV (which features the SalonCon). I’ve included the videos from MTV.com for your view pleasure. I actually hate MTV, with a passion, but these are worth the watch. It’s actually the first new stuff I have watched from MTV in like ten years. Well, seeing how I am doing this overview of the Steampunk genre, of course I am a fan. I am also contributing to the genre with the development of my Steampunk-Horror setting, The Dead Wastes. The RPGBN is also home to fellow Steampunk setting developer, Stargazer, and his wonderful world of Asecia. I know Tom from Geek Emporium has a soft spot for Steampunk. If any readers or fellow bloggers have a love for the genre, feel free to speak up and leave a comment! It would appear that MTV’s video feeds are down this morning, I can get them to work on their site either. Worked flawlessly last night, I’ll post back when they’re up. And the videos are back up! Thanks so much for the defining of the genre but my question is where is the line drawn? Is Ebberon Steampunk or is it just flavored by it? Ships powered by elementals, horse-less wagons and allowances for PC innovation is a strong part of the setting. Another question is, does it have to be set in the Victorian period? Is Steampunk really a template used with a setting or a campaign that I can place into the realm of my choosing? B.G.’s last blog post..Look in the phonebook under "Wizard"
@B.G. : Ah, you have stumbled upon the catch 22 of defining any genre. Where to draw the line? I would consider Eberon steampunk, but it also is heavily influenced by epic fantasy. Which does it have more of? I would say fantasy. This is where the individual has to make their own judgment calls. Does it have to be set in the Victorian period? I would say no. But I am sure that would cause a stir among “purists.” I think Steampunk is a theme you can add to any setting/campaign. It can be used much in the same way people use other themes, such as horror. You can have just a scene or location with the element, an adventure, a series of adventures, or even the entire campaign. Until the Committee of RPG Genre Standards (or the fictional standardization organization of your choice) published THE definition of Steampunk, I recommend this article as a sort of guide and not a definitive standard. Thanks for stopping by & posing the questions! Ebberon – Just call it Fantasy with Steampunk influences.